North Carolina's Haunted Houses are some of the scariest and best in America! Hauntworld.com rates and reviews the best and Scariest haunted houses, haunted attractions, and Halloween events in America! Woods of Terror is located in Greensboro, North Carolina. Please share this page and leave your reviews of one of America's best and scariest Haunted Houses. When you find yourself in Greensboro North Carolina go to Woods of Terror. There’s scary and then there’s insane scary. Woods of Terror is insane scary and has been ever since it opened 27 years ago. 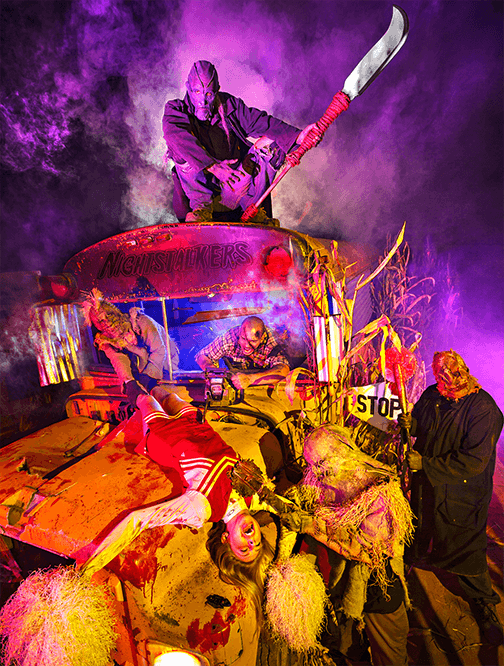 Woods of Terror, a haunted house production located on McLaurin Farm’s 32 acres just off Church street in Greensboro, North Carolina, is the brainchild of Eddie McLaurin who designed and built all of the attractions. By day, Eddie is a mild mannered, 6-foot 4-inch haunt entrepreneur. By night he transforms into a 7-foot horror monster named Bone Daddy, with a red and black mohawk as well as a 6-foot python draped around his neck. “Managing a staff of nearly 175 people, ordering supplies, handling finances, and constructing sets…that’s the business side of things. Dressing up every night and scaring people is the fun side of things,” said McLaurin. “Arachnophobia” This haunted attraction features an assortment of live snakes, spiders, and other creepy crawlers. “Creepersville” Fall is a time for harvest, but they won’t be harvesting corn. The loathsome nightstalkers will be harvesting their favorite food…you! “Industrial Nightmare” According to legend many years ago, a greedy company laid off scores of workers, and they still inhabit the shuttered plant. Every night they have a feast, and visitors are the main course. “3-D Clown Town” This 3D haunted house is chuck full of scary clowns and childhood phobias, where guests go on a wild ride and wonder if the walls are really alive. “The Blood House” Inside this haunted adventure, you’ll find a building full of beautiful lady vampires, but don’t be fooled. These creatures of the night are looking for a special donation. “The Awakening” This extreme haunted house experience calls up wandering, hungry zombies who want to have you for dinner. “Horror Movie Classics” No haunt would be complete without Jason, Michael and Freddy, and Woods of Terror puts them in the most surprising places, sure to scare you silly inside the Horror Movie Classics haunted house. “Blackbeard’s Revenge” is home to the famous and scariest pirate himself. Is he still alive after all these years? Are tales of his beheading just rumors? This ruthless haunt will play with your mind leaving you frightened, alone and wondering what’s reality. “Miners’ Massacre” Once the site of a tragic accident, the evil dead now haunt every visitor who dares to enter. “The Slaughter House” is another extreme haunt experience where the bloody meat cleaver becomes the least of your fears. Getting in is easy, but getting out…not so much. “The Purge” The new founding fathers introduced an American tradition to build a better America by cleansing our nation. This is known as THE PURGE. Inside this haunt, you’ll no longer fear the dead, you’ll fear the living! “Blackout Terror” creates fear of the unknown, whereby willing participants agree to don a black hood, then make their way through a completely dark house. “Monster Midway” For this haunted midway, they start off every night with a parade of horrific monsters and then sing the National Anthem and end with fearsomely loud fireworks. While individual attractions may change from year to year, “Monster Midway” remains a perennial favorite and every night for the past 7 Halloween seasons, Woods of Terror has opened with this parade. Nearly 100 ghoulish monsters stomp the parade route, brave guests pose with them for photos, and the National Anthem is sung. “People just love our midway. It’s a place for customers to shop in our Bootique, enjoy concessions, and stay for the music from our live DJ. It’s fun and sort of sets the mood for the horrors to come”, said McLaurin. Don’t let their midway fun fool you though. These haunts can be terrifying for children and adults alike. “Woods of Terror is so frightening that we rate our haunt as PG-13 and we do not offer child prices because we do not cater to children and no child under 5 will be admitted. In fact, I also tell adults who get scared easily not to come here, but that just makes them want to come here all that much more”, says McLaurin with a sly grin. With top notch entertainment and scary fun haunts, it’s no wonder that year after year Woods of Terror is named one of the nation’s leading haunted house hotspots and with thousands of visitors each night, Woods of Terror also has a significant impact on the area’s economy. In addition, McLaurin Farms is host to a variety of annual fund raising events to benefit local charities. Even during the Christmas season, Woods of Terror morphs into the region’s largest festival of lights. McLaurin Farm has something going on all the time, from breast cancer awareness events to special parties for kids with multiple sclerosis. “It’s a way for us to give back to others throughout the year,” said McLaurin. Question: Your farm location has been around for awhile...correct? Has that helped you or hindered you into transitioning it into an October ScreamPark? Answer: Although the land has been in my family for 4 generations and passed down to me, I started the Woods of Terror from nothing 27 years ago. I had to take what was a cattle farm and turn into a haunted attraction. Question: What do you attribute much of your success to? -AND- Who do you attribute much of your success to? Answer: I don’t know about the other guys, but my success is a result of hard work, and there's a long list of individuals who have helped me along the way. I have to start with Jesus because so many times when I was growing the haunt I was only one bad decision away from closing. So many incredible things have happened or have fallen into place that are unexplainable. You would not believe them if I I told you. Next would be family, starting with my grandparents who let me play out my entrepreneurship on their property. You could imagine their reaction when I told them my plans for a haunted attraction and how I planned to execute it. Next, my Dad: Although we do not agree on everything, he taught me to work hard and never quit. Also my Mom: She helps me to this day. My Girlfriend: She runs the day to day operations. And,the list goes on and on. My staff: I have a great maintenance man,great makeup artists, and some truly incredible actors. It takes a big team to make the dream work. And of course, it doesn’t hurt to hire a great public relations/ marketing and media buyer. Question: Your haunt is well known in the haunted house community and throughout NC for giving back to the community. What specifically is your favorite or most memorable? Answer: I have had several events, such as breast cancer awareness night, a trunk or treat for children with Muscular Dystrophy, a fund raiser for a local 14 year-old boy in our community who is battling cancer by supporting the “Do it for Johnny” Campaign to raise funds for medical bills. But my favorite way to give back is my scholarship program. Three years ago, I decided to give back to my staff so I launched a scholarship program for employees who "need a little extra help". Each scholarship is $ 1,000. My senior staff and I look for individuals who are deserving and are hardworking and dedicated to the Haunt World. The 1st year started with a 10-year veteran actor who was struggling to finish college. We also chose a 2-year actor fighting a medical battle but displayed courage and dedication by coming to work every night in spite of his illness. I have awarded these scholarships to individuals who are amputees who work harder than non- disabled employees and a staff member who is deaf. One year, a staff member who is wheel-chair bound needed assistance buying a new wheelchair. Basically, I give out two scholarships each year, one for a female employee and one for a male . Question: Over many years, the haunted house industry seems to go through frequent trends sometimes as frequent as annually. Do you work with those ever changing trends or do you prefer to stay more traditional with your haunt events? and why? Answer: People generally do not like change. However, I learned awhile ago that changing my haunted attraction is beneficial and profitable for me. I consistently change about one-third of my show each year and will continue to grow and improve every year. I like to think that I know my audience and I try and evolve the attractions to keep my customers coming back, because it is exciting and surprising and most of all fun to be scared! The trend of using Facebook and social media has absolutely helped my haunt. However, the trends of zombie paintball or paintball hayrides I avoided. It really just depends on what the trend is at the time. Some things water down my haunt, so I decide against them. I do one thing... I do Halloween and I do it right! Question: What are your future plans for haunting North Carolina? Answer: Just as I have done in the past 10 years, I will continue to bring in new things and exciting changes that have never been seen in a haunt before, and I will continue to train my staff so we provide the best actors in the Piedmont Triad which is a big part of Woods of Terror’s success.